This is the finest quality air hockey table on the market for the price! This air hockey table is endorsed by Danny Hynes (11-time USAA World Champion), Tim Weissman (10-time Champion), and Mark Robbins, 2-time Champion and designer of the Gold Standard air hockey tables. The Gold Standard Home Pro model features solid, low-profile, professional-style aluminum rails for superior bounce and bankability! You will achieve pro-quality action with the full size 3-3/16" diameter puck, which is designed to stay on the table. The playfield features a wear-resistant laminate surface that will provide years of durability along with a centerline and face-off circle for competitive play. 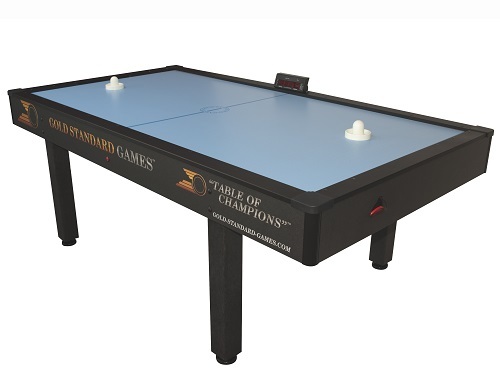 The Gold Standard Home Pro model air hockey table provides fun, excitement and superior play for everyone from beginner to professional!